a riveting portrait of one of the great women of our time. May 4, 1898: Born Golda Mabovitch in Kiev, Russia. 1903: Mabovitch family moves to Pinsk; father, Moshe, immigrates to Milwaukee. 1906: Golda, her mother and sisters, move to Milwaukee, where she attends Fourth Street School. 1912-14: Golda runs away to live with sister Sheyna and brother-in-law Shamai in Denver. 1914: Golda returns to Milwaukee. She graduates from North Division High School and attends Milwaukee Normal School for one year. Dec 24, 1917: She marries Morris Meyerson, who has moved from Denver to Milwaukee. Winter, 1918: Golda attends First American Jewish Congress in Philadelphia as a Milwaukee delegate. 1921: Golda and Morris immigrate to Palestine. 1922-1924: The Meyerson’s live and work on parched Kibbutz Merhavia in the Jezreel Valley. Nov 23, 1924: Son, Menachem, born in Jerusalem. May 17, 1926: Daughter, Sarah Meir Rehabi, born in Jerusalem. 1928: Golda is secretary of the Women’s Labor Council (and its sister, Pioneer Women), a division of the Histadrut, the large labor organization governing Jewish affairs in Palestine. 1932-1934: To save Sarah from a kidney disease, Golda takes the children to live in the U.S.; while here, she campaigns for the Pioneer Women, who raise funds for Palestine. 1934-1948: Golda raises funds, creates housing and jobs for millions of immigrants, initiates a form of unemployment compensation, and becomes a board member of the Histadrut. 1941: England issues its White Paper largely forbidding the immigration of Jews to Palestine. 1947: In an effort to establish peace in the Middle East, England withdraws from the region. In its stead, the U.N. Partition awards territory to both Jews and Arabs separately. 1948: Trying to forestall war with the Arabs, Golda secretly visits King Abdullah of Jordan. Returning to Tel Aviv, she signs the Declaration of the Establishment of Israel. Golda raises $50 million from American Jews for arms that save Israel in war with Arabs. 1948-1949: Golda goes to Russia as Israel’s first ambassador. 1950-1956: Golda’s “golden years” serving as Israel’s Labor Minister. 1956-1965: Golda serves as Israel’s Foreign Minister. 1965-1969: Golda “in retirement” heads the Mapai (Labor) Party. 1969: Visited Fourth Street School. 1969-1975: Golda is Israel’s Prime Minister. 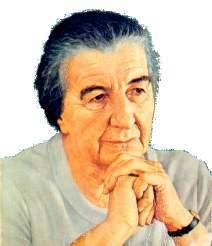 Dec 8, 1978: Golda dies in Hadassah-Hebrew University Medical Center in Jerusalem at age 80.